Ready To Indulge This Thanksgiving? Americans are notorious for indulging in a little bit too much food and drink on Thanksgiving. That might be an understatement. For those of you claiming to eat “normal” sized portions on this annual day of thanks, I don’t believe you. In the grand scheme of things, one day of overindulging will not kill you. Nor will it make you gain serious poundage. You might feel bloated and like you weigh ten pounds more than usual, but give your body a few days to get back into its regular routine and you’ll be good as new. 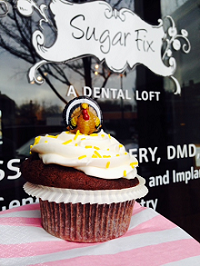 We here at Chicago’s Sugar Fix Dental Loft have no qualms about eating and drinking what you please while spending precious valuable time with family and friends. Dig in! Enjoy the feast you (or someone braver than you) spent all day cooking, slaving away in the kitchen. However, as dental health professionals, Dr. Jessica T. Emery and her team at Sugar Fix want you to dive into that turkey and homemade gravy without permanent damage to your lovely smile. Thanksgiving typically involves at least one tooth-staining food and one tooth-staining beverage. Both red wine and cranberry sauce flow nonstop during this particular holiday. Stop. I know what some of you are going to say. We all know a glass of red wine a day is beneficial to your heart and use that as scientific backup for why we have a glass of red every night. Keep in mind that what is good for your heart is not so good for your teeth and their ivory-shaded enamel. Don’t let staining foods and drinks ruin a perfectly healthy, sparkling smile. No need to freak out here, ladies and gentlemen. Eating cranberry sauce and drinking a delicious Bordeaux for one meal will not – I repeat, will not — discolor your teeth forever. That would be a bit extreme. If you are one of those people that do whatever it takes to make sure your teeth are so white they virtually glow in the dark (like this writer), then you might want to take it easy on the staining foods and drinks. Perhaps skip the cranberry sauce and choose green beans; opt for white wine instead of red. Helpful tip to survive Thanksgiving? Be thankful and grateful that you have access to unlimited clean drinking water. Another helpful tip? Drink plenty of H2O before, during and after your magnificent meal. Water helps to rinse away the staining molecules and pigments that adhere to the surface of your teeth. It also helps your body digest food more efficiently; thus, making you feel less stuffed. Disclaimer: this is not an excuse to eat seconds, thirds, fourths, etc. Drinking more water does not equate to a free pass to pig out and eat for no reason. If you’re not hungry, stop. Lastly, make sure you brush and floss your teeth before going to bed as another Thanksgiving Day comes to an end. Excellent oral hygiene is the best way you can avoid staining and discoloration of the teeth. Contact Sugar Fix Dental Loft today with questions on how you can keep you smile white as snow.